Bobbing is a village and civil parish in the Swale district of Kent, England, about a mile north-west of Sittingbourne, and forming part of its urban area. The main village of Bobbing lies along what is now the old A249 with the Church, Primary School and Village Hall clustered together with a scattering of houses. The parish of Bobbing however is much more extensive and continues along the old A249 to encompass the hamlet of Howt Green which includes the only original public house currently named the Dancing Dog Saloon. In 2003 the Cremation Society of Great Britain opened the "Garden of England Crematorium" on the outskirts of the village. According to the 2011 census Bobbing parish had a population of 1,969. The parish of Bobbing, according to Edward Hasted in 1800, contained about seven hundred and eighty acres of land, of which forty were wood. The mediaeval manor house of Bobbing Court, now a Grade II listed ruin, was built by the Savage family; it passed to the distinguished soldier Sir Conyers Clifford, and then by marriage into the St. Leger family. The village church, St Bartholomew, is a Grade I listed building, which is in the diocese of Canterbury and deanery of Sittingbourne. According to Edward Hasted in 1798, the church consisted of two small aisles and two chancels, having a tall spire steeple at the west end of it, in which are five bells. The strange career of Titus Oates, inventor of the Popish Plot (a fictitious conspiracy that gripped the Kingdoms of England and Scotland in anti-Catholic hysteria between 1678 and 1681), included a brief period as Vicar of Bobbing. He was presented with the living by the local squire, Sir George Moore (who had recently purchased Bobbing Court) in 1673, but his drunkenness and blasphemy so horrified his parishioners that they ejected him before the end of the year. 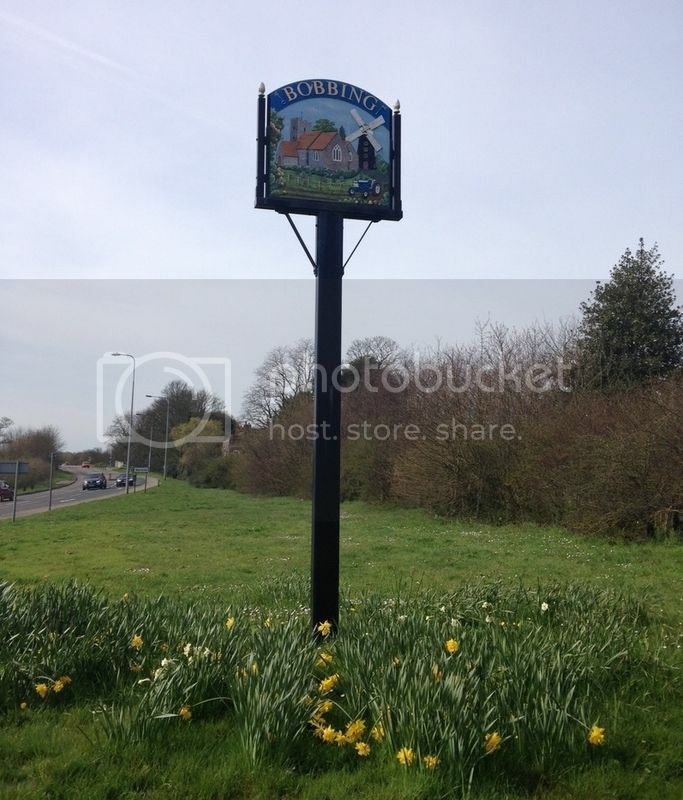 Is not located at the village sign itself, but is very close and affords a good view of the sign.